For other uses, see Mound (disambiguation). A mound is a heaped pile of earth, gravel, sand, rocks, or debris. 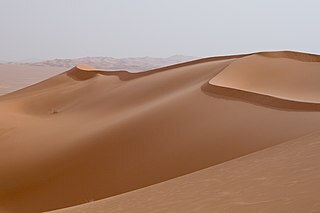 Most commonly, mounds are earthen formations such as hills and mountains, particularly if they appear artificial. A mound may be any rounded area of topographically higher elevation on any surface. Artificial mounds have been created for a variety of reasons throughout history, including ceremonial (platform mound), burial (tumulus), and commemorative purposes (e.g. Kościuszko Mound). Gravel is a loose aggregation of rock fragments. Gravel is classified by particle size range and includes size classes from granule- to boulder-sized fragments. In the Udden-Wentworth scale gravel is categorized into granular gravel and pebble gravel. ISO 14688 grades gravels as fine, medium, and coarse with ranges 2 mm to 6.3 mm to 20 mm to 63 mm. One cubic metre of gravel typically weighs about 1,800 kg. In the archaeology of the United States and Canada, a mound is a deliberately constructed elevated earthen structure or earthwork, intended for a range of potential uses. In European and Asian archaeology, the word "tumulus" may be used as a synonym for an artificial hill, particularly if the hill is related to particular burial customs. While the term "mound" may be applied to historic constructions, most mounds in the United States are pre-Columbian earthworks, built by Native American peoples. [ citation needed ] Native Americans built a variety of mounds, including flat-topped pyramids or cones known as platform mounds, rounded cones, and ridge or loaf-shaped mounds. Some mounds took on unusual shapes, such as the outline of cosmologically significant animals. These are known as effigy mounds. Some mounds, such as a few in Wisconsin, have rock formations, or petroforms within them, on them, or near them. The indigenous peoples of the Americas are the pre-Columbian peoples of North, Central, and South America and their descendants. In geometry, a frustum is the portion of a solid that lies between one or two parallel planes cutting it. A right frustum is a parallel truncation of a right pyramid or right cone. While these mounds are perhaps not as famous as burial mounds, like their European analogs, Native American mounds also have a variety of other uses. While some prehistoric cultures, like the Adena culture, used mounds preferentially for burial,  others used mounds for other ritual and sacred acts, as well as for secular functions. The platform mounds of the Mississippian culture, for example, may have supported temples, the houses of chiefs, council houses, and may have also acted as a platform for public speaking. Other mounds would have been part of defensive walls to protect a certain area. The Hopewell culture used mounds as markers of complex astronomical alignments related to ceremonies. Mounds and related earthworks are the only significant monumental construction in pre-Columbian Eastern and Central North America. 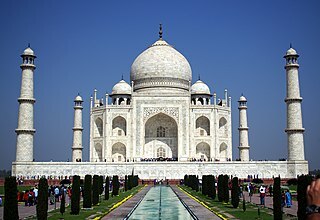 A monument is a type of—usually three-dimensional—structure that was explicitly created to commemorate a person or event, or which has become relevant to a social group as a part of their remembrance of historic times or cultural heritage, due to its artistic, historical, political, technical or architectural importance. Examples of monuments include statues, (war) memorials, historical buildings, archaeological sites, and cultural assets. 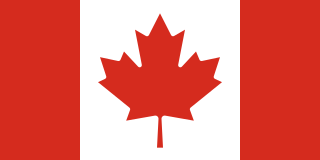 If there is a public interest in its preservation, a monument can for example be listed as a UNESCO World Heritage Site. Mounds are given different names depending on which culture they strive from. They can be located all across the world in spots such as Asia, Europe and the Americas. "Mound builders" have more commonly been associated with the mounds in the Americas. They all have different meanings and sometimes are constructed as animals and can be clearly seen from aerial views. Kankali Tila is a mound located at Mathura in the Indian state of Uttar Pradesh. The name of the mound is derived from a modern temple of Hindu goddess Kankali. The famous Jain stupa was excavated here in 1890-91 by Alois Anton Führer. Mathura is a city in the North Indian state of Uttar Pradesh.It is located approximately 50 kilometres (31 mi) north of Agra, and 145 kilometres (90 mi) south-east of Delhi; about 11 kilometres (6.8 mi) from the town of Vrindavan, and 22 kilometres (14 mi) from Govardhan. It is the administrative centre of Mathura district of Uttar Pradesh. In ancient times, Mathura was an economic hub, located at the junction of important caravan routes. The 2011 Census of India estimated the population of Mathura to be 441,894. Uttar Pradesh is a state considered to be part of central, northern and north-central India. Abbreviated as UP, it is the most populous state in the Republic of India as well as the most populous country subdivision in the world. It is located in the north-central region of the Indian subcontinent, has over 200 million inhabitants. 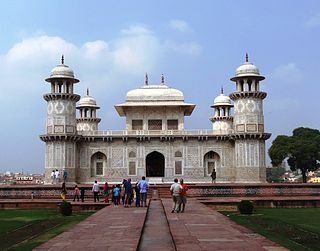 It was created on 1 April 1937 as the United Provinces of Agra and Oudh during British rule, and was renamed Uttar Pradesh in 1950. The state is divided into 18 divisions and 75 districts with the capital being Lucknow. The main ethnic group is the Hindavi people, forming the demographic plurality. On 9 November 2000, a new state, Uttarakhand, was carved out from the state's Himalayan hill region. The two major rivers of the state, the Ganga and Yamuna, join at Allahabad (Prayagraj) and then flow as the Ganges further east. Hindi is the most widely spoken language and is also the official language of the state. Mound, as a technical term in archaeology, is not generally in favor in the rest of the world. [ citation needed ] More specific local terminology is preferred, and each of these terms has its own article (see below). "Mound" . Encyclopædia Britannica . 18 (11th ed.). 1911. The Hopewell tradition describes the common aspects of the Native American culture that flourished along rivers in the northeastern and midwestern United States from 100 BCE to 500 CE, in the Middle Woodland period. The Hopewell tradition was not a single culture or society, but a widely dispersed set of related populations. They were connected by a common network of trade routes, known as the Hopewell exchange system. A gallery grave is a form of megalithic tomb built primarily during the Neolithic Age in Europe in which the main gallery of the tomb is entered without first passing through an antechamber or hallway. There are at least four major types of gallery grave, and they may be covered with an earthen mound or rock mound. The Great Serpent Mound is a 1,348-foot (411 m)-long, three-foot-high prehistoric effigy mound on a plateau of the Serpent Mound crater along Ohio Brush Creek in Adams County, Ohio. Maintained within a park by Ohio History Connection, it has been designated a National Historic Landmark by the United States Department of Interior. The Serpent Mound of Ohio was first reported from surveys by Ephraim Squire and Edwin Davis in their historic volume Ancient Monuments of the Mississippi Valley, published in 1848 by the newly founded Smithsonian Museum. The various cultures collectively termed "Mound Builders" were inhabitants of North America who, during a circa 5,000-year period, constructed various styles of earthen mounds for religious, ceremonial, burial, and elite residential purposes. These included the pre-Columbian cultures of the Archaic period, Woodland period, and Mississippian period; dating from roughly 3500 BCE to the 16th century CE, and living in regions of the Great Lakes, the Ohio River Valley, and the Mississippi River valley and its tributary waters. Petroforms, also known as boulder outlines or boulder mosaics, are human-made shapes and patterns made by lining up large rocks on the open ground, often on quite level areas. Petroforms in North America were originally made by various Native American and First Nation tribes, who used various terms to describe them. Petroforms can also include a rock cairn or inukshuk, an upright monolith slab, a medicine wheel, a fire pit, a desert kite, sculpted boulders, or simply rocks lined up or stacked for various reasons. Old World petroforms include the Carnac stones and many other megalithic monuments. The Earth/fertility Mississippian cult was associated with earthen platform mounds. A platform mound is any earthwork or mound intended to support a structure or activity. Spiro Mounds is a major Northern Caddoan Mississippian archaeological site located in present-day Eastern Oklahoma. The 80-acre site lies near the Arkansas River in Fort Coffee, seven miles north of the town of Spiro. In archaeology, earthworks are artificial changes in land level, typically made from piles of artificially placed or sculpted rocks and soil. Earthworks can themselves be archaeological features, or they can show features beneath the surface. The Kincaid Mounds Historic Site c. 1050-1400 CE, is the site of a city from the prehistoric Mississippian culture. One of the largest settlements of the Mississippian culture, it was located at the southern tip of present-day U.S. state of Illinois. 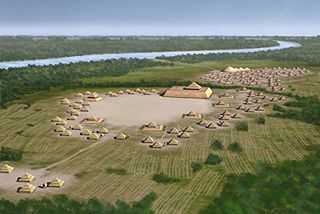 Kincaid Mounds has been notable for both its significant role in native North American prehistory and for the central role the site has played in the development of modern archaeological techniques. The site had at least 11 substructure platform mounds. Artifacts from the settlement link its major habitation and the construction of the mounds to the Mississippian period, but it was also occupied earlier during the Woodland period. The Oak Mounds is a large prehistoric earthwork mound, and a smaller mound to the west. They are located outside Clarksburg, in Harrison County, West Virginia. Old Town is an archaeological site in Williamson County, Tennessee near Franklin. The site includes the remnants of a Native American village and mound complex of the Mississippian culture, and is listed on the National Register of Historic Places (NRHP) as Old Town Archaeological Site (40WM2). The Marietta Earthworks is an archaeological site located at the confluence of the Muskingum and Ohio Rivers in Washington County, Ohio, United States. Most of this Hopewellian complex of earthworks is now covered by the modern city of Marietta. Archaeologists have dated the ceremonial site's construction to approximately 100 BCE to 500 CE. 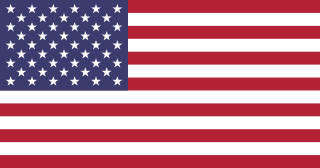 ↑ National Park Service (August 30, 2015). "Effigy Moundbuilders". National Park Service. Retrieved August 30, 2015. ↑ Smith, C. R. (March 9, 2000). "An Introduction to North America's Native People: Adena". Cabrillo College . Retrieved August 30, 2015. ↑ Smith, Vincent Arthur (1901). The Jain stupa and other antiquities of Mathura . Retrieved 14 November 2015.